Unique talents of the five members of northern Minnesota’s The WoodPicks have helped them forge a unique blend of instrumental dexterity and vocal presence. Their enjoyable stage show incorporates strong harmonies and musical style that features their own arrangements of original music and old favorites. The group came together in 2005 when the band started playing northern Minnesota venues. Their acoustic mix includes Gospel, Bluegrass, Country and Americana music. One of their original arrangements, "Barn Again!" was included in a collection of rural Americana for the Smithsonian Institute. They perform at county fairs, bluegrass festivals, urban and rural venues and corporate events. In 2012 the WoodPicks were featured on the PBS televison show Prairie Musicians. Here’s what Barb Gravel, the production manager for Prairie Public had to say about the session. 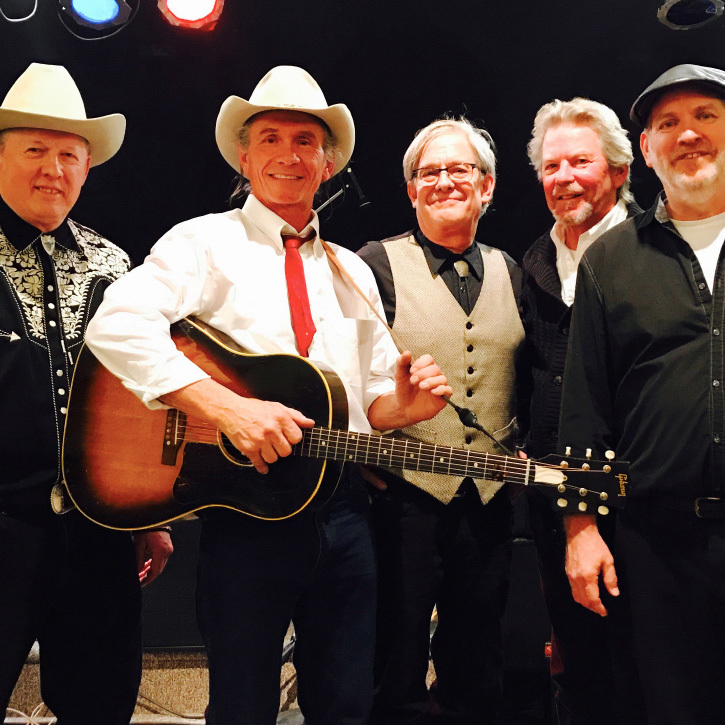 "Get ready for a boot stompin’, toe tappin’ good time with the WoodPicks from Thief River Falls, Mn. This group of five multi-talented musicians perform a mix of gospel, bluegrass, country and Americana music that turn any venue into a barn dance. Their passion to perform is apparent and the talents of J.D. Kezar on harmonica are astounding." Members of the WoodPicks include Greg Dally, mandolin; Gary Broste on bass fiddle; Gene Lunsetter, guitar; Milo Ballingrud, banjo; and J.D. Kezar, fiddle, harmonica, jaw harp and guitar. All five contribute vocally to the band. The members have many years of experience playing in various groups throughout the continental United States, Canada and Alaska. The WoodPicks have been fortunate to share the stage with such great acts as the Grascals, Monroe Crossing, Dailey and Vincent, actor/singer Ned Beatty, JD Crowe, John Cowan, High Plains Tradition and Special Consensus. This traditional bluegrass and Americana band can be funded under performing art grants. The band consists of front man JD Kezar, playing the violin and harmonica and singing harmony and lead. Joe has gained valuable experience playing in bands since a youngster in the 1960’s. He resides with his family in Thief River Falls, Minnesota where he owns Kezar Music, a full-service music store. Greg Dally plays mandolin and guitar. He demonstrates his rich band experience every time he steps to the mic to sing lead or harmony. Greg was born and raised in Baudette, Minnesota. He currently lives in Thief River falls and owns and operates Falls Radiator. Gary Broste plays the Dog House Bass, sings harmony and some lead. Gary is an experienced player, having been involved with multiple bands and multiple musical styles. He was raised in Worthington Minnesota and played in local bands there and eventually throughout the Midwest. His 40 plus years of experience keeps him in demand for studio sessions and live performances. Gary and his Wife reside in beautiful Bemidji, Minnesota. Milo Ballingrud plays the banjo and supplies some vocal help. Milo was born and raised in Thief River Falls, but moved away as a young man, only to return to his roots after 30 years in the big city. His return home along with his love for bluegrass helped spark the rise of the WoodPicks as a working band. Gene Lunsetter plays guitar, supplies lead vocal and harmony. Gene’s experience gained touring with The Back Behind the Barn Boys for a decade coupled with his natural teaching abilities enable him to create great arrangements for the WoodPick’s stage shows. Gene teaches in the Grygla, Minnesota school district and resides with his family in Thief River Falls, Minnesota.